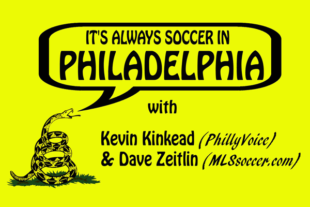 In Episode 8 of the It’s Always Soccer in Philadelphia podcast, Kevin Kinkead and Dave Zeitlin recap the 2016 Philadelphia Union campaign and look ahead to offseason issues facing the team. In my opinion “It’s Always Soccer In Philadelphia” is by far the best podcast around! Thanks Kevin Kinkead and Dave Zeitlin. Unlike in the past Soccer has a solid fan base in spite of the laundry list of issues with the Union, a solid foundation is in place at the professional level. Soccer can sustain and survive on it’s own especially with the growth of MLS and the ever changing demographic in the USA. The echo chamber of ignorance by other sports and their media morons and fans is no longer able to intimidate and silence us. We neither want or need the “top 4 main stream media” to exist. Soccer has it’s own mains stream media. With all this being said The Union must step up their game. I don’t buy the “money ball” concept. Not when you are in one on of the largest sports and media markets in the country and you are competing with NYC,NYRB,TOR,ATL, ORL,DC,evolving Columbus, and eventually MIA who are bringing in DPs and quality MLS talent who are difference makers. We are not a 2nd rate outpost and the Union needs to wake up to that fact. We need 2 star DP’s and quality MLS talent and another USMNT player or 2. I may be the only one wanting the Union to compete with NYCFC,NYRB,TOR..etc talent wise. I am sick and tired of our sports teams being out classed and out spent and not in a position to sign star and MLS quality . Bedoya is a good signing but the team needs to build around him with quality. The buffoonish dog and pony show that was the Union a couple years ago has been kicked to the curb and replaced with Earnie Stewart. He will, hopefully, make this organization one of the best if not the best in MLS. I am not comfortable with Jim Curtin and staff at the helm. In my opinion Jim Curtin is limited in his outlook and was uninspiring as to what this team is capable of accomplishing. Trotting out the same formation and running struggling players into the ground tells me that he is clueless about in-game adjustments and not competent using his 18. Earnie Stewart also needs to upgrade the speed,pace, skill and athleticism of the Union. They are with out a doubt the slowest team in MLS and too slow to high press which is why in the 2nd have, teams ran by the Union midfield and defense as if the were traffic cones and their attack was stifled. Sapong is not a starter and lacks separation speed and quickness. Pontius(my favorite) doesn’t have great speed but he is fast enough an is skilled and elusive enough to be effective. The same can be said of Herbers and Ilsinho. Alberg(who’ll probably be sent packing) walks faster that he runs. He can score but his lack of pace prevents him from being a dominant player. Earnie Stewart gave good answers during the final press conference. Jim Curtin as usual, was all tired cliches and talking points with very little substance. Kind of like he coaches. Here’s hoping Earnie Stewart will bring in some quality, talent, and speed for the starting XI.